I was 20 when I became Katherinne’s sponsor. I was an idealist college student with a little spending money from my grandparents, a part-time job in the bowling alley, and really no sense of budgeting. But I had experienced poverty in Brazil and Chile, and I loved . So when I got a note in the mail asking me if I would take on another child sponsorship, a little girl in Colombia, I said yes. Of course! I had money from Memaw! I’ve never regretted it. It was 1999 then and she was six years old. 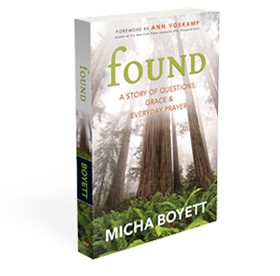 And I was just Micha Boyett. We wrote letters through plenty in our lives. Every year a new picture and every year she was taller, standing proud with shiny shoes pressed together, hands clasping in front of her pants that just grazed her ankles. She liked helping her mom wash the dishes and coloring. I told her I was getting married. (I sent a picture.) She asked me to pray for her mother. I asked her to pray for my grandfather. I prayed that she would know how much Jesus loved her. She prayed that God would bless me. What was my favorite color? she wondered. Do you like any sports? I asked. I like to read, I told her. She liked math. You can grow up and do something wonderful, I said. You could be a teacher or a scientist! You could be a mother! When you sponsor a child, the years run together. The picture on the fridge changes. The little girl’s legs get longer. You wonder how long it’s been since you last wrote a letter and you add it to your to-do list. You send pictures when you think of it. And then, she’s a woman. Right there, posing with her right knee just a little bent, her form-fitting t-shirt revealing the truth: you’ve got a teenager on your hands. I should have written more. I wish I had. I love teenagers. I wish I’d told her what I tell the 15-year-old girls I’ve spent the past ten years working with. I should have written about her value, her beauty of spirit. I wish I’d reminded her that God has great plans for her life, that education is miraculous, that books are a secret that unlock mysteries. I wish I had told her that she was, will always be, deeply loved by her Creator. Two years ago I got a letter. Katherinne left the program, Compassion International informed me. She had left early. That was all the information they had for me. No final picture, no letter of goodbyes. Because they had no control of her departure there was nothing they could share with me. Why had she left? Where was she going? I had no answers. Of course, I feared the worst. Drug lords. Prostitution. Pregnancy. A life of destructive poverty. But there was no way to know. She was gone. And there was her face. I’d know it anywhere. And beside it her information: a student at the university, pictures of her on a trip to somewhere, laughing with friends on a bus. That beautiful, long black hair, that quiet spirit I can sense through the wires. Until I found you. Such words.